The health benefits of both cannabis and coconut oil are remarkable. 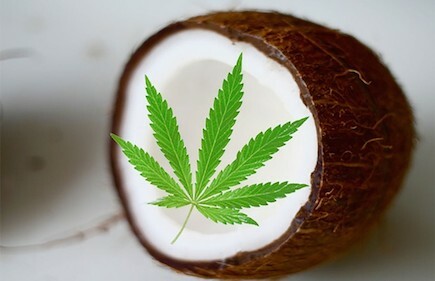 Coconut oil has a very high saturated fat content for a plant-derived oil, making it an ideal candidate for cannabis infusion that can create incredibly versatile product with all the benefits of both. Cannabis coconut oil can be applied in so many different ways and part of the fun is experimenting and finding out what works for you. Here are seven ways to incorporate cannabis coconut oil into your life, and you can check out our easy recipe for cannabis coconut oil here. When cannabis is infused into the right substance, it can be absorbed through the skin when applied topically. Apply cannabis coconut oil on sore muscles or feet and it will work quickly to reduce aches and pains. Coconut oil can replace butter or other cooking oils in your favorite recipes by simply replacing the amount of oil that the recipe with coconut oil instead. You can also get creative and just add the infused oil to anything you think could be interesting – a spoonful in an otherwise unmedicated dish will definitely be the cherry on top. While the healthiest thing to do is avoid sunburns all together, it’s summertime and sun happens. Coconut oil infused with cannabis is a great way to help a sunburn heal and minimize skin peeling in the following days. Use cannabis-infused coconut oil as massage oil for a whole new level of relaxation. Make sure to find a masseuse or friend who is also a fan of 420 as the cannabis will be absorbed through the skin (unless gloves are used). The amount and quality of fat in coconut oil means that it becomes quite saturated with cannabis when infused. Empty capsules can be filled with the liquid oil by using a dropper. You can use coconut oil as a creamer by blending it the oil with hot coffee. Just stirring the oil into the coffee won’t achieve the creamy texture and frothy top – you’ll need a blender to create that smooth effect. It’s almost like a latte, but with none of the milk and much more marijuana. Just combine a cup or two of coffee, a spoonful of cannabis coconut oil in a blender, pulse until frothy, then enjoy immediately. Do you deal with chapped lips, hands or feet? Cannabis-infused coconut oil is great for helping the healing process, as well as alleviating the discomfort of dry skin. Apply directly to the afflicted area or use preventatively to avoid dryness in the first place.